Hang Tuah overcame Garuda to advance into the semifinal stage. The guests trailed by 15 points after first quarter, but they rallied back to get the 5-point lead at the halftime and eventually won the game 64-59. Hang Tuah dominated on the defensive end, holding Garuda to just 4 points in second quarter. It was a good game for American forward Nahshon George (206-93, college: Idaho, agency: Haylett Sports) who led his team to a victory with a double-double by scoring 30 points, 21 rebounds and 4 blocks. His fellow American import guard Keenan Palmore (185-94, college: Lenoir-Rhyne) contributed with 27 points, 6 rebounds and 4 assists for the winners. 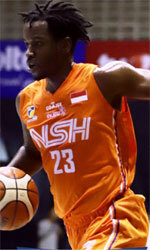 George is a former Eurobasket Summer League player, which is considered top international summer league in the market. American point guard Gary Jacobs (188-92, college: Cent.Washington) answered with 24 points and Luke Martinus (188-88) added 11 points and 7 rebounds in the effort for Garuda. Garuda's coach tried various players' combinations and tested in total eleven players in this game, but that didn't help.